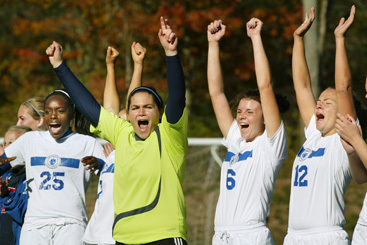 MAKING A STATEMENT: Members of the Princeton Day School girls soccer team shout for joy after topping Wardlaw-Hartridge 4-0 last Sunday in the state Prep B championship game. Pictured, from left, are Britanny Murray, Jess Frieder, Jacqui Stevens, and Katie Gibson. At its Monday evening meeting, Township Committee unanimously approved a bond ordinance for the appropriation of $4,087,000 for the installation of a new community pool, and authorized the issuance of $3,882,650 bonds or notes to finance part of the cost. In a 5-1 vote last week, Borough Council approved an agreement with police union PBA Local 130 pertaining to its contract with the municipality from January 1, 2010 to December 31, 2012. Council members Jenny Crumiller, David Goldfarb, Andrew Koontz, Barbara Trelstad, and Kevin Wilkes voted in favor, while Roger Martindell voted against the measure. Members of Borough Council voiced their support for the work of the Delaware and Raritan Canal Commission (DRCC), passing a resolution to that end at their meeting last week. The Princeton Merchants Association-organized workshop on Monday focusing on customer service as a priority saw about 155 participants coming from 30 Princeton businesses. The training held in the librarys Community Room was led by representatives from Zingermans, an Ann Arbor-based family of businesses that grew from a single deli to include a bakery, creamery, restaurant, coffee roasters, a candy manufacturing company, a mail-order business, and a training operation. This is a job that really is demanding under the best of circumstances, said Congressman Rush Holt (D-12) in an interview the day after his re-election for a seventh consecutive term. With the complicated messages that came from the voters this year, it will be especially hard, he added. “It’s a full circle moment,” said Edwidge Danticat, describing the aptness of her Friday evening appearance at the Princeton Public Library to discuss her new book, Create Dangerously. The inception of the book, she explained, occurred two years ago when she visited Princeton University to deliver the Toni Morrison Lectures. Courtney Banghart laughs when she recalls that her Princeton University womens basketball team was picked seventh in the Ivy League media preseason poll prior to her debut season as head coach in 2007-08. New Jersey Symphony Orchestra’s newest Music Director formally met the Princeton community on Friday night as the orchestra came to Richardson Auditorium for its second performance of its Princeton series. Newly-appointed conductor Jacques Lacombe had already demonstrated commitment to New Jersey and its composers with last week’s performances of music of former Princeton University composer Roger Sessions. For this past Friday night’s concert, Mr. Lacombe continued his survey of American music with a lesser-known work of George Gershwin as well as Johannes Brahms’ towering Piano Concerto No.1 in d minor. Maureen OKeefe, marketing director of Yanina & Co., is enthusiastic about the beautiful pieces of jewelry created by Yanina Fleysher, the president and award-winning designer of the company.